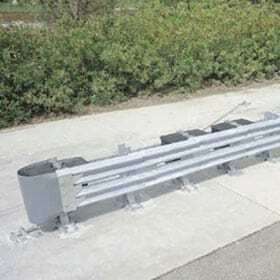 The QuadTrend 350 system is designed to protect the ends of concrete barrier. The QuadTrend 350 system consists of a series of Quad-Beam fender panels, slip bases, a tension strap, a redirective cable, and sand-filled boxes. It meets NCHRP 350, Test Level 3 as a redirective, gating end terminal. During head-on design impacts, the system directs the nose of the vehicle away from the hazard. For angle impacts, the vehicle is redirected back onto the roadway. As a gating system, the QuadTrend 350 requires an adequate clear zone. The system features high reusability and most major components are reusable after design impacts.